When making a preserve an essential part of the process is the setting point. 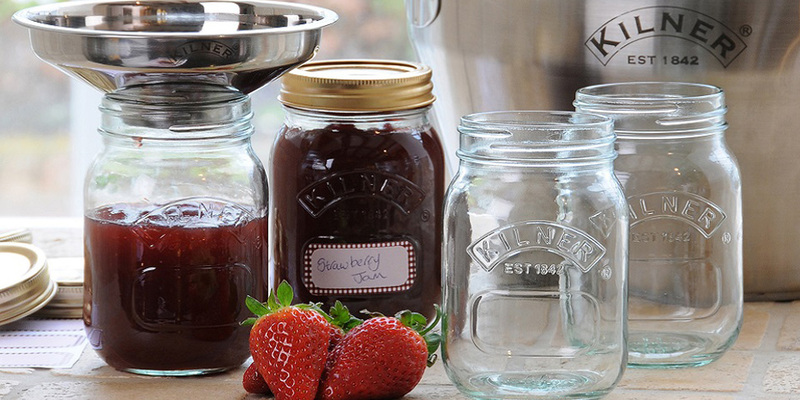 Find out how to test your jam or jelly by taking a look at our easy to follow guide. - The fruit mixture will not rise as vigorously in the preserving pan as it has done earlier in the cooking process. - The fruit mixture will make more noise as it boils and you will see large bubbles forming on the surface. Every recipe is different and some preserves will start to set after only 3-5 minutes where as other preserves may take 15 minutes or even longer so it is very important that you start testing for setting early so that you avoid over cooking your preserve. When testing for the set of a chutney then the following method should be used. Once you think your chutney is ready, take a clean wooden spoon and drag it through the chutney mixture inside the pan to form a channel, the channel needs to be deep enough to expose the base. If this channel fills up with liquid straight away then your chutney has not reached the setting point but if the channel remains visible then the chutney has reached setting point and you can bottle it immediately. To test for setting when making jams, jellies or marmalades you have three methods to choose from; the wrinkle test, the flake test and the temperature test. It is up to you which method you choose because all will deliver the same outcome so please choose the method you find the easiest. In order to get your recipe to the desired setting point you will need to raise the temperature of your mixture to boiling point, you can only do this once the sugar is fully dissolved. Once the recipe is at boiling point allow to continue cooking on a rolling boil until it thickens and gets a glossy sheen to it. At this point you need to use one of the following methods to test the set. Once you think setting point has been reached remove the pan from the heat, making sure to use hand protection and place it on a heatproof surface. Next, using a spoon, transfer some of the boiling preserve from the pan to a cold saucer or plate, which has been chilled in a fridge. Allow the preserve to cool then push it using your forefinger. If the preserve has reached setting point then it will wrinkle. If you only see a slight amount of wrinkles appear then the setting point has not been reached so return the pan to the heat and continue to boil for another 1-2 minutes and then repeat the testing process. Once you think the setting point has been reached remove the pan from the heat, making sure to use hand protection and place it on a heatproof surface. Next, using a clean wooden spoon, stir it around in the preserve until the head of the spoon is completely coated. Hold the spoon away from the pan and allow it to cool slightly then with the spoon vertical hold it back over the pan. If setting point has been reached the preserve will slide down the head of the spoon and hang off the end but it will not drop back in to the pan unless you shake the spoon firmly. If the preserve runs straight off the spoon and back in to the pan then it has not reached setting point so return it to the heat and boil for a further 1-2 minutes and then repeat the testing process. It is important when conducting this test that it is a clean wooden spoon which you use and not one you have previously used to stir the sugar as it dissolves otherwise you will get a false result. With the pan still on the heat put the thermometer into the preserve and move it around through the preserve, this will make sure that you get an overall reading of the temperature. Now remove the pan from the heat and read the temperature. After you have measured the temperature please take care to place the thermometer on a heatproof surface to cool down.